When having guests over, I enjoy having something ready on their plates when arriving at the table. It makes the table look festive and inviting. I always choose something that can be made and plated ahead, doesn’t need heating up and can stand a while.It also adds to atmosphere, giving people immediately something to do, and everybody is usually quite eager to taste what is in front of them. I found this recipe in Coté Sud (Express editions). Chop the olives and mix with the chopped rosemary. Slice a few olives in “rings” for decoration. Shape teaspoonfulls of cheese into balls and roll in the olive/rosemary mixture. Place in fridge until needed. Peel the melon like an apple. Start at one end and slice thin rings until you get to the seeds. Turn the melon 90 degrees and start again at the end, slicing thin rings. Keep turning until you have only the middle section with seeds left. Mix the vinegar and sugar in a small casserole and let it reduce to a syrup. Cover a pretty plate with the thin slices of melon, overlapping slightly. Pick some goats cheese balls with a toothpick and place on the melon. Drizzle with the reduced vinegar syrup and decorate with some olive rings and fresh rosemary. Another find in Elle à table magazine, no 51 this time. It is great on a bed of mesclun or even served warmed. I serve it at room temperature and with a nice crusty bread to mop up the wonderful sauce. Cut the tops off the round courgettes and scoop the flesh out with a spoon. Steam until just tender. Wash the long courgettes and with a potato peeler, slice into thin roundsstarting at one end. Peel and wash the onions and slice into thin rings. Slice the greens on the the dagonal for interest. blanch in boiled water for 1 minute to get rid of the “bite” of the onions(optional). Mix with the sliced rounds in a small bowl. Mix the lemon juice and zest, olive oil, sesame oil, Tamari sauce and chives and the mixed milled pepper and pour over the courgette mixture. Leave to marinade for about 15 minutes. 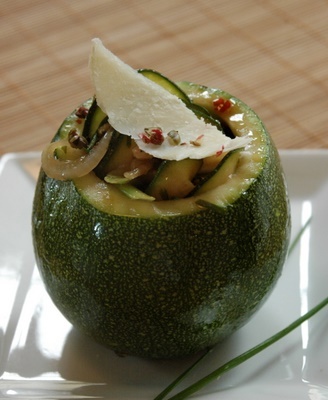 Fill the round courgettes with the marinated filling and pour some of the marine over the filling. Serve with a drizzle of olive oil, some milled pepper and a shaving of parmesan cheese. Decorate with some chives. 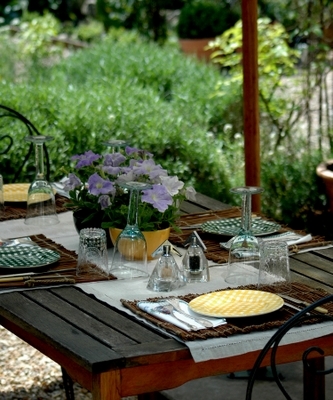 Optional: For a more substantial meal, serve on a bed of fresh mesclun with a crusty bread. And finally, summer sees apricots at their peak. An adaptation from Ma cuisine aux herbes et aromates, Françoise di Vanni (Larousse). Butter 6 ramekins and sprinkle with sugar. Wash the apricots, half and take out the seeds. Mix the gingerbread into fine crumbs. Grind the cinnamon, cardamom and sichuan pepper together in a mortar and pestle, add the thyme and mix together with the gingerbread crumbs. Cover the base of the ramekins with a layer of gingerbread crumbs. Cover with the apricots, round side facing up. Whisk together the eggs and cream. Pour over the apricots. Sprinkle with the brown sugar and bake for about 15 to 20 minutes until set and nicely browned. 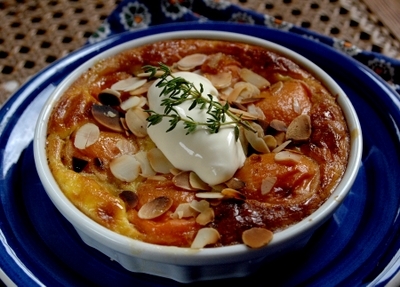 Grill the almonds in a dry pan until golden and sprinkle over the apricots after baking. Serve while still warm with a dollop of ice cream or créme fraiche and a branch of thyme for decoration. –>Looks like you and Mum had fun cooking up a storm. 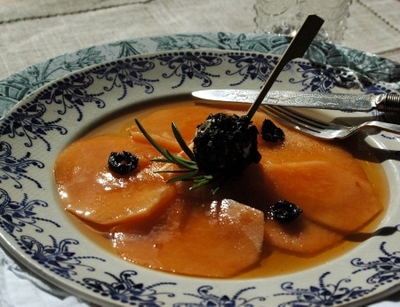 I’ve told her I want this apricot dish on the menu for Christmas when she and Chris are here. I didn’t realise what a good photographer you were Ronell – I could use you with my Whiteport product & catalogue shots if you weren’t so far away !! Love Jennifer. –>Quite lucky of you to already have des courgettes rondes. I am waiting for these to come on farmer’s market stands this year. And I will buy them all! 😉 Great menu!